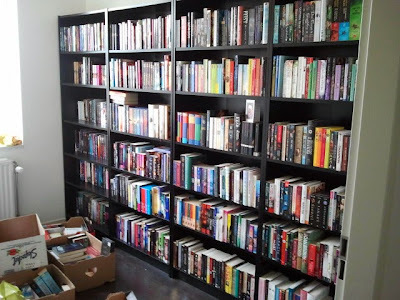 Between the last book haul and now, we moved to a new home and aside from it being a lot bigger, more comfortable and more beautiful, the added bonus is that we now have a spare bedroom solely devoted to my books. WHICH IS AWESOME. Obviously. And I've been happily shelving my books, so except for The Iron King by Maurice Druon, I didn't add physical copies to my library. Which I know have: a library. HOORAY! -Once Upon a Kiss by Jayne Fresina: I really enjoyed Miss Molly Robbins Designs a Seduction by the same author, and this sounds really entertaining as well! -The Dark World by Cara Lynn Schultz: So obviously I hit request after I saw the words: centuries-old-battle between warlocks and demons. Duh. -Played by Liz Fichera: I haven't read Hooked, but I'm curious about this one! -Good Girls Don't Date Rock Stars by Codi Gary: an old love rekindled! I'm counting on lots of sparks! 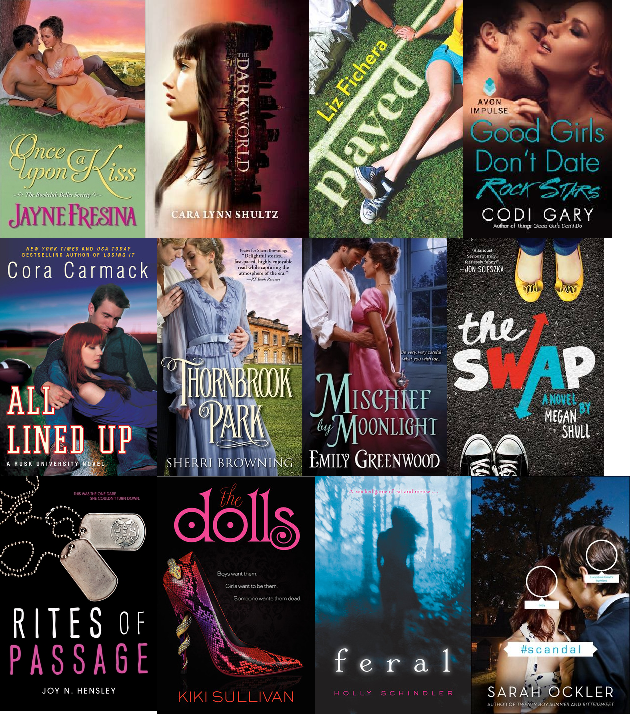 -All Lined Up by Cora Carmack: I really enjoyed Losing It, and I need more books set in college! -Thornbrook Park by Sherri Browning: a disowned widow! A steamy affair! Simmering tensions! All of me says yes to this! -Mischief by Moonlight by Emily Greenwood: falling in love with your fiancee's best friend is probably never a good idea, but will also probably make for an interesting story. -The Swap by Megan Shull: a guy and a girl swapping bodies. Come on, you know you want to read this! If it's anything like Freaky Friday, I'll be happy. -Rites of Passage by Joy Hensley: I always love a good story about a girl in a line of work dominated by men. And there's a secret society involved. -The Dolls by Kiki Sullivan: intrigue, betrayal and lies: YES PLEASE! -Feral by Holly Schindler: this sounds both really creepy and fascinating! -#scandal by Sarah Ockler: SO MUCH EXCITEMENT!! I'm so happy to be participating in a blog tour for this book and it sounds SO GOOD! And I think if anyone can handle something like kissing your best friend's boyfriend, it's Sarah Ockler. All lined up looks good. I have total library envy. 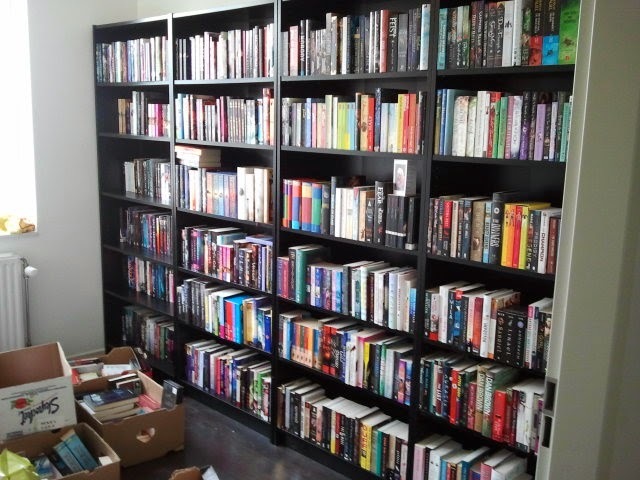 I mean, I like my apartment and my books but I want a room specifically dedicated to the books! Woah. WOAH. That is gorgeous, and I am jealous beyond words. Seeing other people's libraries just make me happy. One, I love books. Two, it validates my own need to keep a ridiculous amount of books on hand. I'm so jealous! I would love to have a whole room devoted to my books! I am so jealous of all of those shelves! Lovely! Congrats on the library. How awesome. I'm in love with your bookshelf. Actually, scrap that, I'm immensely jealous that you have a library!